Tampa might actually get a chance to see John Cena's giant jorts live and in person. Though yet to be confirmed by WWE or the Tampa Bay Sports Commission, according to multiple fan sites including PWInsider.com and WrestleVotes, Raymond James Stadium is heavily rumored to be the host of WrestleMania 36 on April 5, 2020. The Tampa Bay Times reports that in May, the commission placed a bid to host WrestleMania in Tampa in 2023, 2024 or 2025. However, now it appears 2020 is on the table. This would be huge for Tampa. 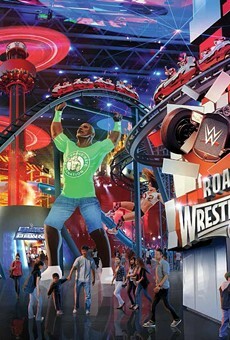 Orlando was the last Florida city to host the "Super Bowl of Wrestling" back in 2017 and that event brought in an estimated $181 million to the city.